Just about every semi-technical person has setup a wireless router at home or in the office, and in that process has wondered which broadcast channel would be the best to use. Sure, some wi-fi routers make it simple and will recommend a channel on their own, but often it’s left up to the user to decide. Let’s face it, most people have absolutely no idea what would be the best wi-fi channel, let alone which to use for a 5GHz wireless N network versus a 2.4GHz 802.11b/g network, or even what the difference between the networks is. For average people, it’s a bunch of meaningless technical jargon, they just want wireless internet, and they want it to be fast, right? 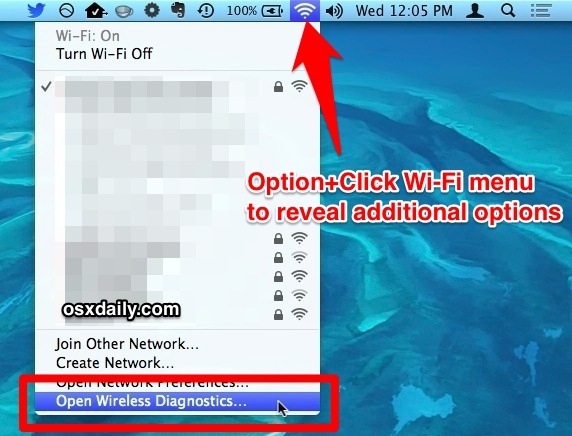 Thankfully, OS X Mavericks makes this simple when a wi-fi router doesn’t, with a simple solution offered through the bundled wi-fi scanner app that works with every single wi-fi router brand out there. In the below screen shot example, the best channels chosen are 2 and 3 for 2.4 GHz, and 149 and 157 for 5 GHz. As mentioned before, changing the broadcast channel will vary depending on the router manufacturer and the IP address used. Using a Netgear router with an IP of 192.168.1.1 as an example, simply point any web browser to that IP, log in using the router admin login (often admin/admin), and look for the “Channel” option, typically located within a “Wireless Settings” or “Broadcast Settings” preference region. Change the appropriate channels for each protocol, save settings, and you’re good to go. The wi-fi network should now be faster with less interference for all devices on the network, not just the Mac used to scan and detect the best channels. 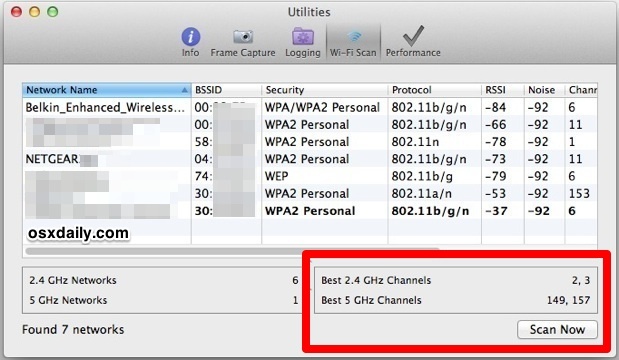 Going further, the amazing OS X Wireless Diagnostics tool can also be used to optimize wi-fi networks further by measuring signal strength as you physically rearrange the placement of a the wireless router in relation to computer hardware. This works exceptionally well and is worth taking the little time to perfect, particularly fi you feel a wireless network is sluggish or problematic. Don’t have access to a Mac or the Wireless Diagnostics utility? Maybe you don’t have OS X Mavericks yet? 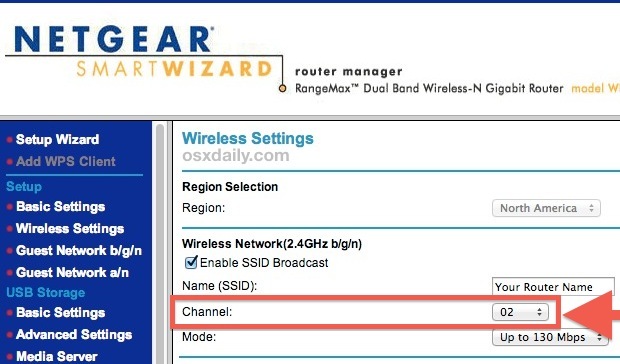 For users who have an iPhone or cellular iPad with the iOS Personal Wi-Fi Hotspot feature, you can use a roundabout trick to detect the best channel to use for a router too. All you need to do is place the iPad or iPhone in the general region of the hardware that will access the primary wireless router, then temporarily turn on the Personal Hotspot. iOS will automatically scan, detect, and choose the best possible channel to use much like the OS X scanner tool, thus one can simply connect to that broadcasted hotspot, see the channel it chose, then turn off the hotspot feature and reconfigure the router to use that broadcast channel. Nifty trick, huh? 3 WEP networks among my neighbors. Besides mine only one other 5GHz network out of 14. What about the “automatic” channel setting for Airport extreme?? Is that just as good? Shame on Apple for recommending channels other than 1, 6, & 11 for the 2.4GHz band. You should NEVER use those other channels. You have to realize that the frequencies these 2.4GHz channels use overlap with the frequencies of adjacent channels. You will only cause more interference issues for neighboring wireless routers that are on channels 1,6, & 11, and for your wireless router that is using one of these non-standard channels. Don’t do it! Well, hold on there… I have 3 or 4 dozen WiFi neighbors near enough to me that I could choose any one of them to try to connect to. Just sticking to 3 channels (1,6,11) does not allow enough room for so many broadcasts. If everyone tried to use only those 3 channels then every one of those 3 channels is swamped! I’d much rather have a neighbor bleed over onto me rather than have them step right on top of me! Me using channel 3 or 4 not only gets me a better signal but also means I’m not stepping so hard on them either. Unfortunately, that’s not correct. You should just stick to the 3 channels 1, 6 and 11. This is because these are the 3 non-overlapping channels in the 2.4 GHz range. You actually make things worse for yourself when using channels 3 and 4. If you and your neighbour both used channel 1, there may be some contention as you have to negotiate usage of the line, and your throughput would be less. But if you were using channel 3, then your networks would interfere with each other,; neither network would be aware of each other and can’t negotiate with each other so you would get to a situation where you’re both effectively “jamming” each other’s signal. is this just for Mavericks? This article has solved a problem that has been driving me nuts for the past four years. I have spent countless hours trying to sort out wifi dead spots in our kitchen which were interfering with streaming. In 20 minutes, following the advice here, it is totally solved. This is why OsX Daily is now, and always will be, the first resource I use for intelligent and knowledgable Mac advice. I cannot thank you enough. We’re happy to help, thanks for reading! There are no recommendations in the wifi tab as shown here, the box at the bottom simply doesn’t exist. Help? The “Best Channels” feature is new to OS X Mavericks, you must be running 10.9 (or newer) to see the recommendations. Same here. I am running 10.9, all I get is a splash screen. Clicking on “Continue” starts a “diagnose”, followed by two options, “Monitor my wifi connection” and “Continue to summary”. No toolbars resp., no Wifi tab or anything like it. I use this often, it is in Mavericks as described. The same here, nowhere to find it, nothing to pull down. “Option + CLICK” does not work for me. The feature exists in Mountain Lion, just in a different place. In the ‘Utilities’ window, choose the ‘Info’ tab (after you’ve done the scan) and look for the ‘Wireless Environment’ section. It will have recommended channels. It treats all located routers as possible interfere, including your own. You may already be on the best channel but it will recommend a different one. Note the signal strength before making changes and after. You need to run it again after making the changes and it will probably recommend your original set channel. And what about the ‘Select Best Channel’ option available on the Airport Extreme? Is that the best option? Yes, that is the best option for Airport Extreme users. Please excuse my ignorance but on the 2.4GHz side of things, my router has “l” and “u” options for several channels (e.g. I can choose “5u” or “5l”). When the app recommends a specific channel, is it referring to the “u” or “l” mode? Hi, pointed here by “The Loop”. Is there any additional information when using an Apple Time capsule? Thank you thank you thank you!!! For the past couple years my internet has been dropping quite frequently from my iMac. Even though I don’t have Mavericks I was able to pick a channel less used in my neighborhood and the results have been fantastic. No more dropped Wi-Fi. I’m sending lots of good karma your way. I am elated and over on the Apple forums everybody is pointing fingers at hardware and software but this hits the nail on the head. Well done. I’m not very tech savvy. The only Apple product in our household is my iPhone 5s and we are constantly being dropped from the network or very slow connection rate. What can I do to help fix this problem?! HELP! c’mon, Megan. Show this to someone who understands this article and ask her or him to set it up for you. I’m using El Capitan there is no Utilites under Window Menus.. In newer versions of OS X there is no “Utilities” item but the same tool is available be selecting “Scan” instead in the “Window” menu. The channel scanner tool must just try to find the least used channel. I assume it does *not* take into account what channel you are connected to in it’s recommendations. 2- your router is turned off. The tool should obviously find the best channel for your environment. Let’s assume the channel scanner tool recommends channel 3. You now turn on your router and set it to channel 3 but, BEFORE you connect your device to the WiFi you re-run the scan. Now, the tool should tell you something different, as ch. 3 will no longer show as clear. Next connect your device to your router still set to ch. 3. Is the tool smart enough to know that you’re now connected to the best channel or (since your router is broadcasting on ch.3) will it still recommend a completely unused channel? My assumption is that it will. If that is the case, then the only best way to use the scanner tool is to run it w/ your router turned off. Thank you so much, very comprehensive, step by step, and it worked.